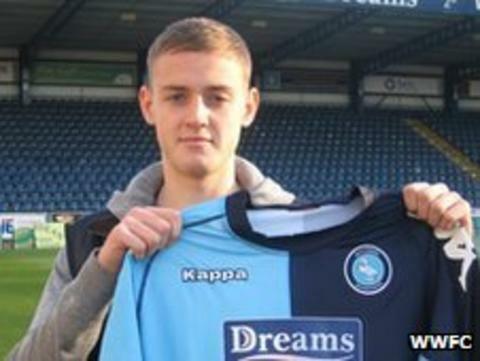 Wycombe have signed Sunderland defender Louis Laing on loan until 14 February. The 18-year-old centre-half, who can also operate at full-back, has played once for the Black Cats. "Louis will be a good addition to the group and I'm really pleased to have him on board," Chairboys boss Gary Waddock told the club website. "We've seen him play a number of times. I know there were some Championship clubs looking at him so it's great we've been able to bring him here." Laing's only senior appearance to date was as a late substitute in Sunderland's 3-1 Premier League loss to Wolves in May last year. The England Under-19 international added: "I'm very happy about it. It will be a great experience for me to play in the first team and I hope I can help the team get out of this rough patch. "I see myself as someone who can play the ball out from the back but can defend as well, so I'd like to think I can do both sides of the game."